A novel additive manufacturing platform was used for the digital fabrication of transparent glass at industrial scale. 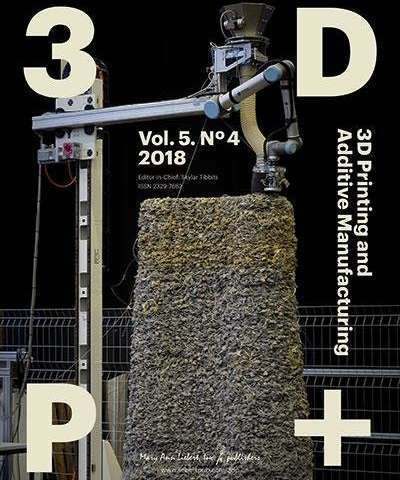 The G3DP2 platform, developed by MIT scientists and used to turn molten glass into 3-meter tall columns, is described in an article published in 3-D Printing and Additive Manufacturing. In the article entitled "Additive Manufacturing of Transparent Glass Structures," Chikara Inamura, Michael Stern, Daniel Lizardo, Peter Houk, and Neri Oxman, Massachusetts Institute of Technology, Cambridge, MA discuss the early G3DP2 printer, which was used to provide proof of concept of the feasibility of creating transparent objects through the deposition of molten glass. The researchers then describe the complete redesign of the system, upgrading it to an industrial platform capable of achieving architectural output. The four objectives of the upgraded G3DP2 platform were increased speed and scale and improved repeatability and reliability. The scientists report on how to understand and control the behavior of the printed glass, the specifications, engineering and control of the platform, and the product design space.